this offer is now sold out! GET FREE COPIES OF OUR NEW FAMILY FUN GUIDE FOR YOUR SCHOOL FAMILIES. This June, Toronto Star Classroom Connection will launch our new Ontario Family Fun Guide. The guide is designed to help families choose from the many great events, activities and attractions happening in Ontario this summer. It’s loaded with information on festivals, day-trips, attractions, and adventures for all ages. It also includes several money-saving coupons for families. In addition, the guide contains lots of Fun Facts! and Did You Know? features about our beautiful province and country. During this special sesquicentennial year, there will be many events that celebrate the 150th anniversary of Canada’s Confederation. Whatever your interests, you’ll find great ideas for family fun listed in the guide. 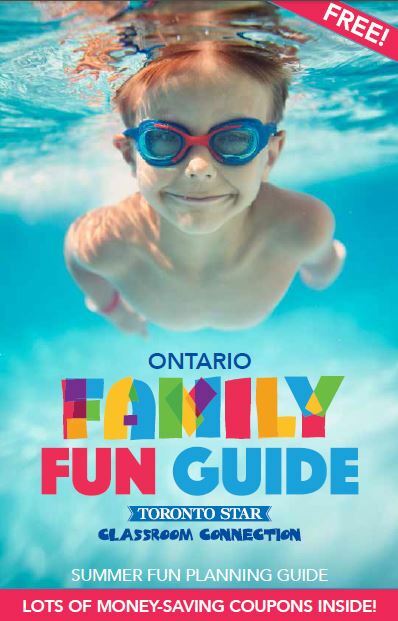 Copies of the Family Fun Guide are available FREE to schools in Ontario. limited copies available. reserve copies for your school families. The information entered on this form will be used to deliver the Ontario Family Fun Guide to your Board, for distribution to schools. Please ensure you type the correct address information. ​address the week of June 5, 2017.